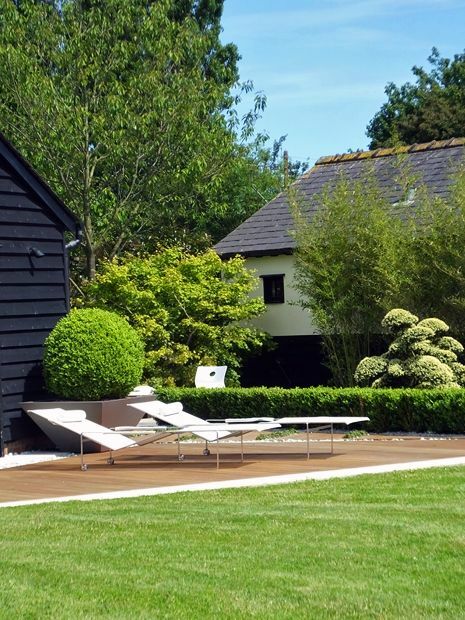 For two of the most important days of the week, this Essex country barn house relieves London EC2's cacophonous carry-on with bucolic restfulness in the perfect seclusion of a picturesque field landscape. Our clients, rather familiar with advantageous separateness, albeit in the surreal stillness of a 38th floor triplex penthouse apartment atop Barbican's Cromwell Tower, have reorganised this 5-hectare estate on the outskirts of Debden Village to suit an active, sporty lifestyle with an enduring love for tennis, swimming and all things playfully bouncy. To sustain such a dynamic familial premise, we embarked on creating an altogether modern country garden, thoroughly underpinned by low maintenance landscaping, when our London roof terrace making was momentarily sidelined to relish the position of principal designers and landscapers in a truly breathtaking location for repeat clients. Surrounded with agricultural land, the north-west facing garden is demarcated by native trees in scattered copses along boundary flint walls, gates and footpaths. Developing into a profuse boscage across the western edge, this campestral yet rather uniform topography was engagingly fostered by the clients in an architectural vs. agricultural dialogue of landscapes. 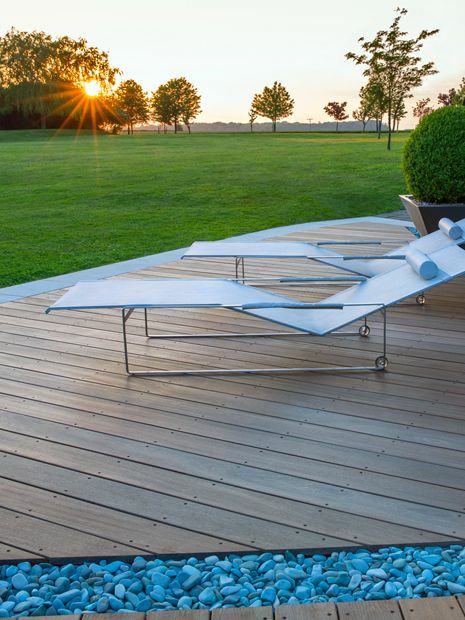 The worldly owners, hailing from South Africa and Sri Lanka, have preserved the setting's authentic materials fabric, where ornamental trees such as Birch, Ginkgo, Maple and Olive are juxtaposed inwardly in recreation, patio and courtyard gardens. Backdropped by a spectacular sunset above a flat horizon, the evening zephyr soothes balmy Essex summer days, turning into mighty tempests in inclement weather. The layout of diversified outbuildings along the north-east perimeter facilitates shelter with framed vistas, where ever-changing field crops blanket a textural scenic background hazily. 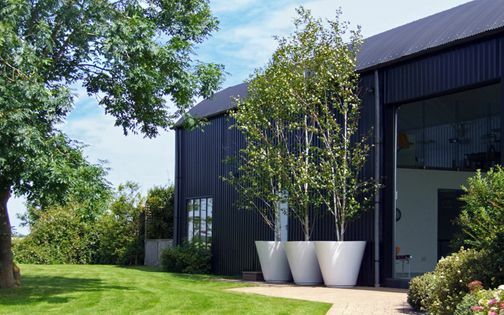 Anchoring inward views, the barn's 25-metre symmetrical back elevation and colossal roofline were softened by multi-stemmed trees and square hedges which connect the building into sprawling lawns – forming a contemporary country garden afront of a rustic landscape. Interwoven throughout the site, the family's outdoor sports amenities are varied, distributed handily around the barn house. This continuing enthralment with alfresco fun and fitness is further extended within a rather imposing 6,000-square-foot, double-height indoor sports barn. The ultra-modern structure and its coal-black corrugated cladding are vaulted by a semi-circular roof, forming an 8-metre-high elevation. 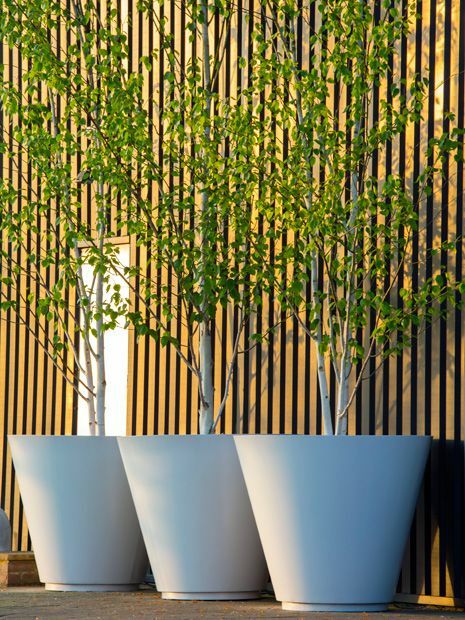 To counterbalance scale and soften edificial presence, while interlinking to both architecture and landscape, we designed a trio of 1.2-metre-high, cone-shaped white planters featuring leafy Silver birch trees as a voluminous focal point which integrates the new barn into its more traditional precursor – adding movement, seasonality and contrast. 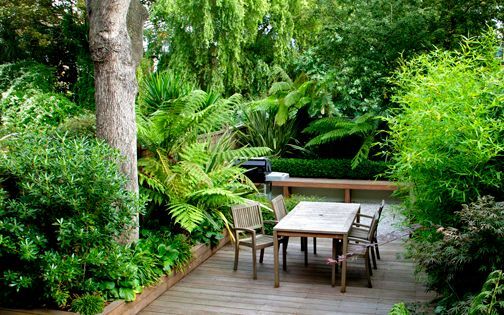 Innovative hedge designs extend both horticultural and architectural lexis alike; none more so than in large landscape gardens, where the verdant embracive expressions of enclosure carve well-proportioned, restful outdoor havens. 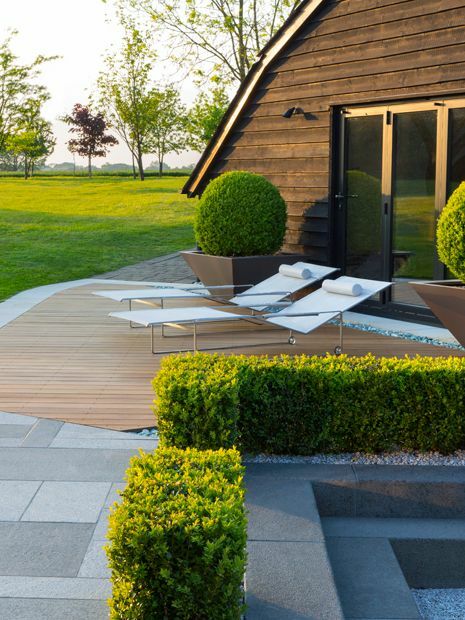 In this modern country garden, a decisive low maintenance landscaping approach asserts finality and finesse rather purposefully and viscerally in equal measure. 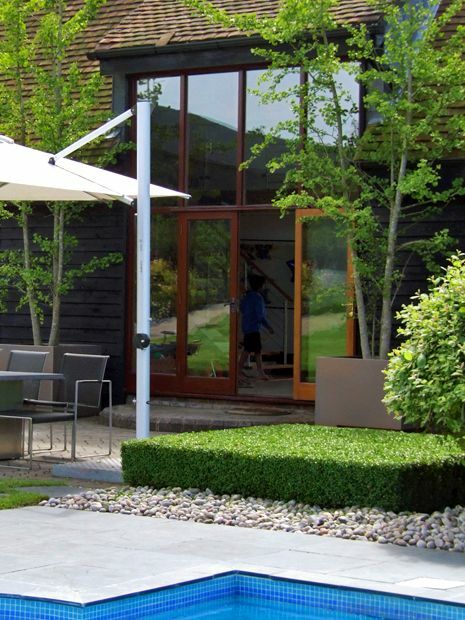 Box hedging of various forms, lineal perennials and uniform grasses are utilised effectively to envelop a broad range of family amenities, and bolster contemporary landscape design layouts by the pool, sunken garden and patio areas. 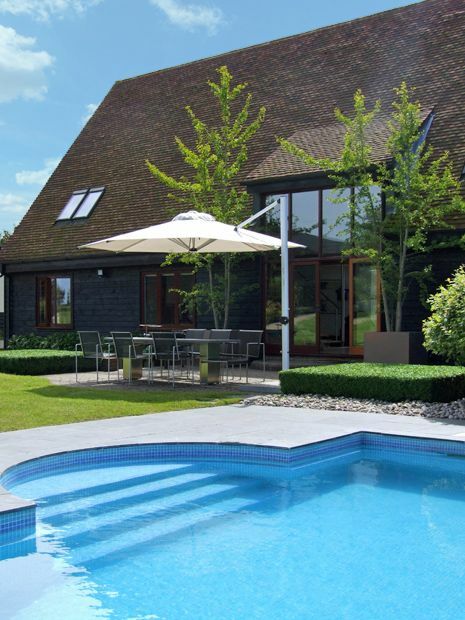 This monocultural mindset minimises non-essential gardening activities, while heightening our clients' hebdomadal excursion to the Essex countryside, when more time can be spent savouring rural field landscapes congruously and quite effortlessly. 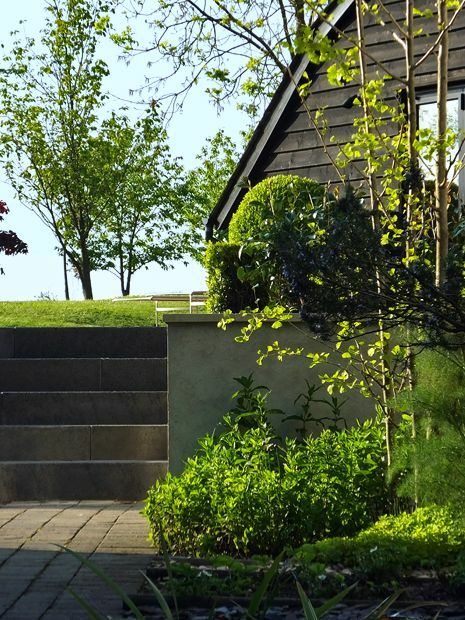 Universally favoured by landscape garden designers, these green frameworks provide a useful design element to layer and elevate level terrains; the unmistakable flatness of this home county aptly enhanced with enclaves of foliage and blooms distinctly accentuated by apposite hedge architectures. However lovingly maintained, large landscape gardens require manageable modi operandi, where pastorality and creature comforts interlace to form a modern-day idyll. Here, in North-west Essex, the twelve acres surrounding the barn house are predominantly carpeted in lawns; their gentle slopes managed briskly and rather enjoyably on a ride-on mower by the owner. 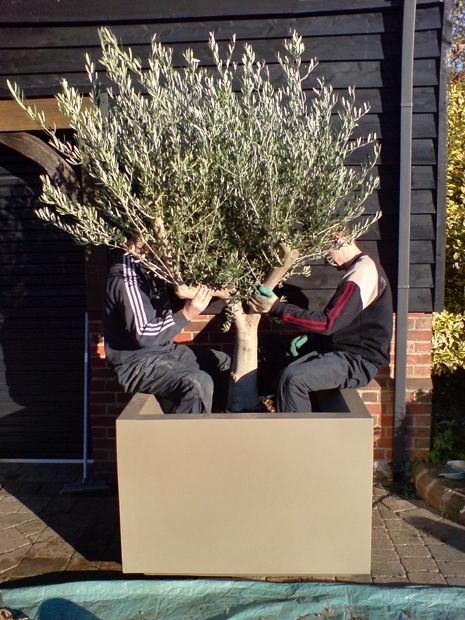 The digital-savvy softer developer is also technically zealous when precise pruning is the call of duty, and since we've planted fledgling hedging throughout the site, our client has been indulging in manicuring these living cuboids to perfection. 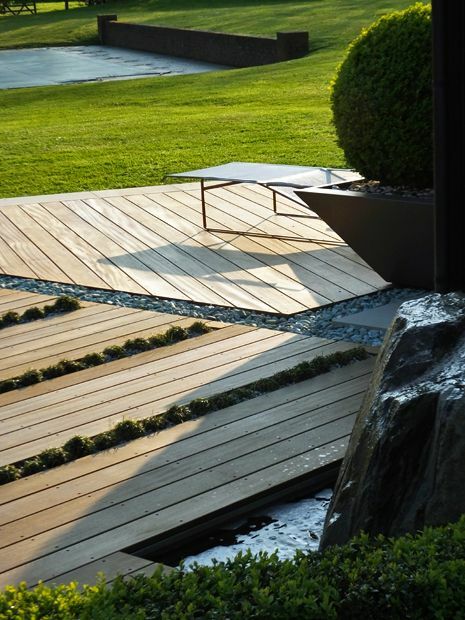 With ample vehicular access, the remaining garden maintenance tasks are handled monthly by a groundskeeping team – the pivotal partners of landscape garden designers in sustaining a blueprint faithful to vision – collaboratively preserving the low maintenance landscaping of a modern country garden and its owners' lifestyle. 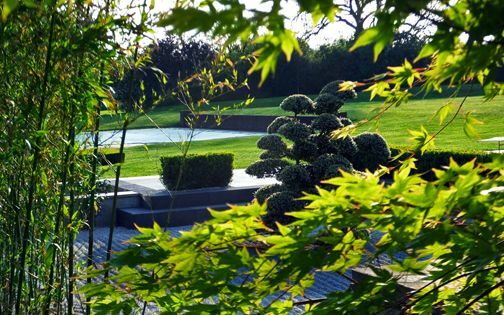 The grounds are landscaped into a dozen separate zones, constructed in a succession of ambitious landscape design projects. 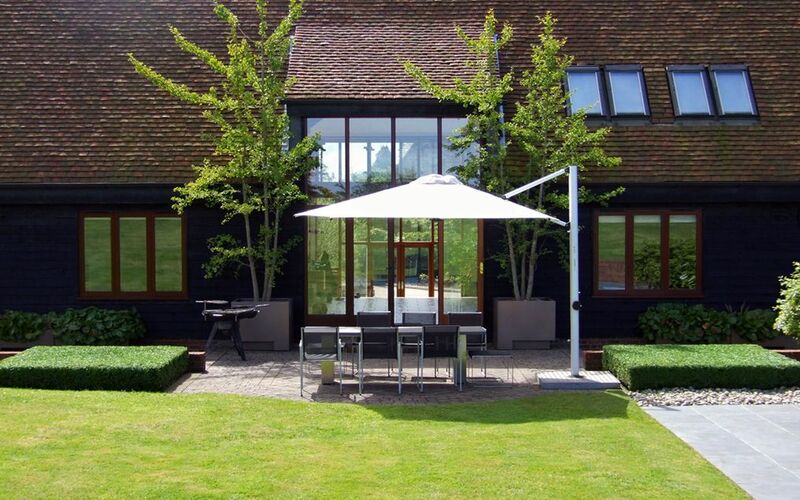 The entrance driveway is flanked by ornamental gardens, leading to an orchard and a tennis court, while a shade patio by the swimming pool is smoothly interconnected by herb and cottage gardens. 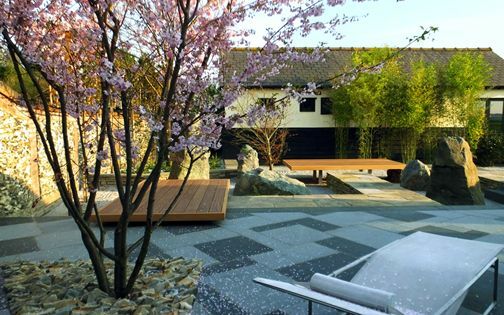 A 5-step stairway guides transition to the upper expanse of grass, where a scattering of native trees unveils views to a sunken Japanese garden followed by a sun lounge along a meandering path towards the sports barn and fields. From the symbolism of a miniaturised Eastern landscape as one of our clients' most cherished family holiday sceneries, to the agrestic naturalism of native landforms, the entire scheme is punctuated with custom-made planters which delineate the quintessence of a modern country garden, where every plant border, shrubbery, pot and trough are efficiently and imaginatively mulched in gravel, pebbles, cobbles and slate chippings to facilitate ease of landscape maintenance. 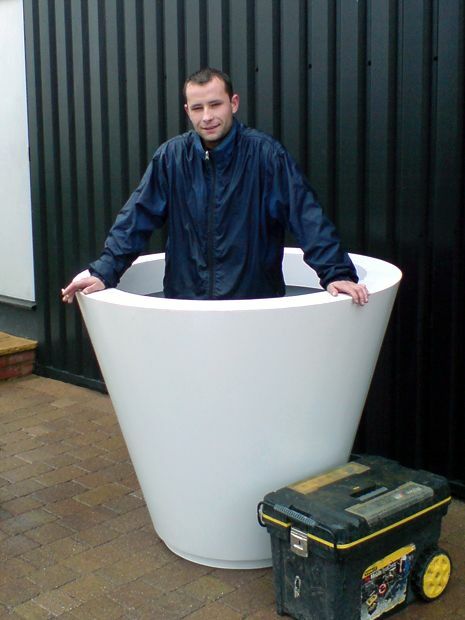 A series of thirty large-scale bespoke planters envelops the site, conveying a definitively architectural approach which continues the modern elements we designed for the clients' Barbican roof terrace. 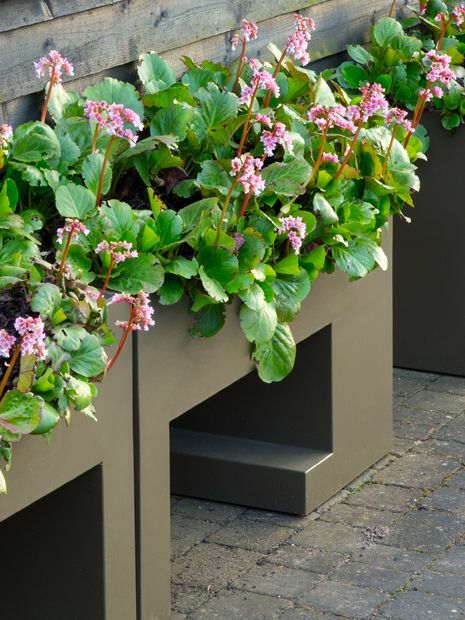 Supersized, personalised and metronomically aligned, these powder-coated containers find their distinguishing niches all the same in an outlying countryside village, where minified landscapes in upscaled vessels articulate considerate customisation in earthy colours. 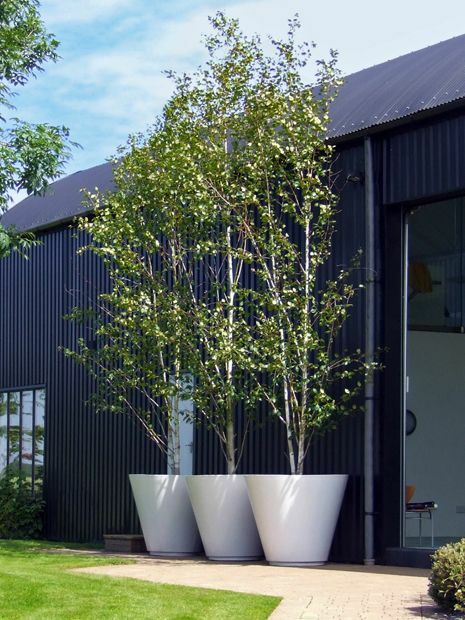 Bronze, Tellurium, Thulium and Sable hues underpin one-off planting design compositions, culminating in the fittingly named Annapurna for the conical white receptacles planted with analogous Himalayan birches. The sunny front driveway benefits from a south-east position, enclosed in a courtyard setting, where Mediterranean garden planting presents evergreen sculptural centrepieces. 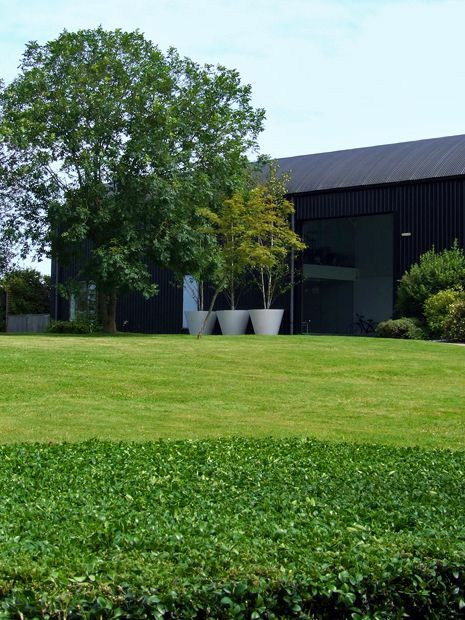 This elevated, rectilinear composition sets the scene for a modern country garden at the back, while pivotally offsetting the barn's elongated front facade. 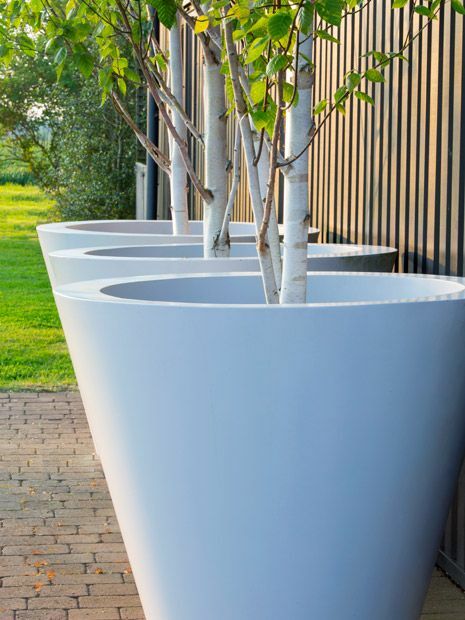 Displayed in fully customised and well-irrigated planters, the low maintenance landscaping simplifies care, endows durability and constructs a bold architectural statement. 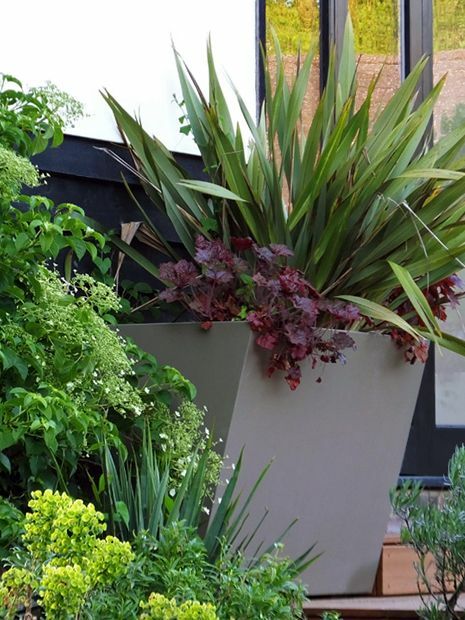 Lavenders, Olive and Palm trees moderate the expanse of deep-toned cladding, producing a leafy interconnection to indoor plants viewed via full-height windowpanes – flourishing self-sufficiently during extended periods of the owners' absence. 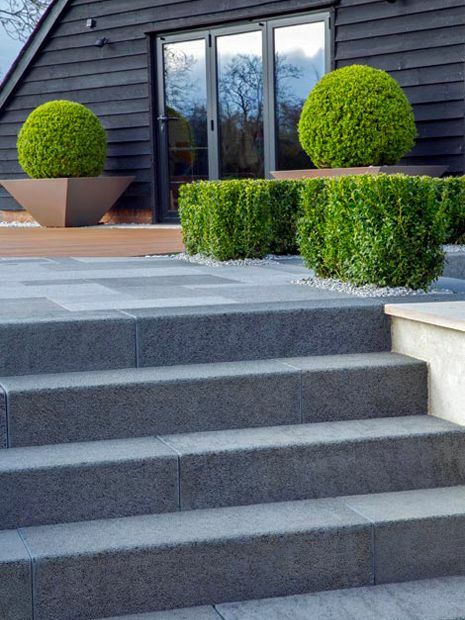 Landscape innovation requires a reciprocal design process, and the clients love to customise every aspect of their homes, both in town and country. 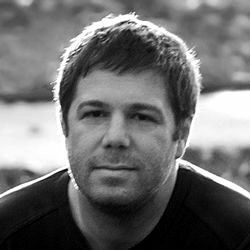 Collaborating over three projects, our insight into the family's lifestyle and aspirations fostered profound input, enabling the origination of variously designed contemporary gardens. These diverse environments, from au courant urban life and its lofty roof terraces to embracing nature and wildlife in the countryside, are narratively intertwined with design modernity and decor elegance. 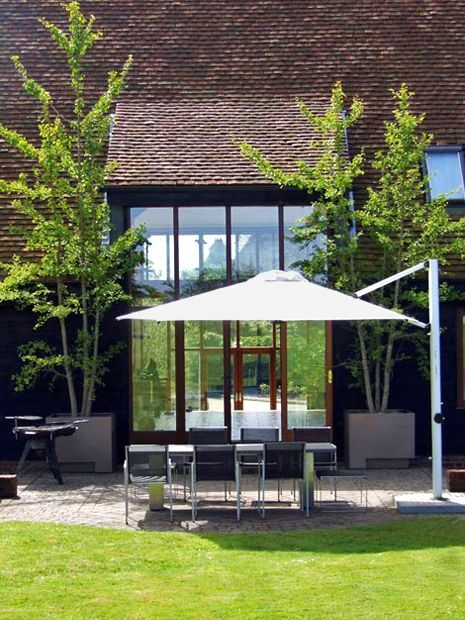 The family's pastime, nonchalantly spent exercising alfresco, mending sports cars, gardening, cooking and playing the piano, is fully catered for throughout their modern country garden, appropriately completed with contemporary outdoor furniture. 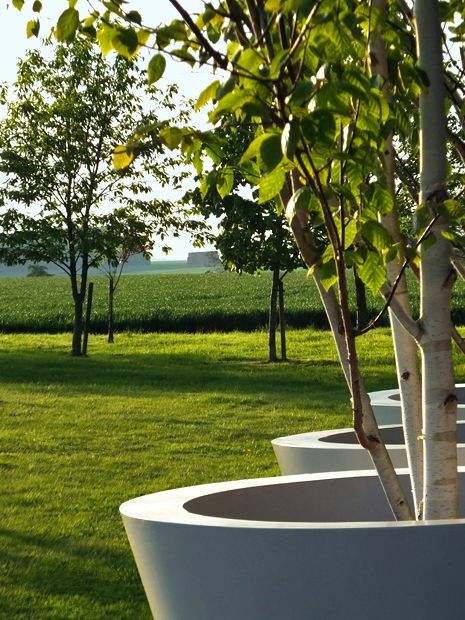 While a good deal of spare time is devoted to far-flung travels and sports tourism, the ethos of these autonomous landscape gardens is designedly low maintenance. When our clients relocated to Barbican's Cromwell Tower, the location's centrality not only offered architectural distinctiveness in coveted anonymity, but also a convenient gateway to East of England, where a weekend country home dwells a mere hour away in North-west Essex. 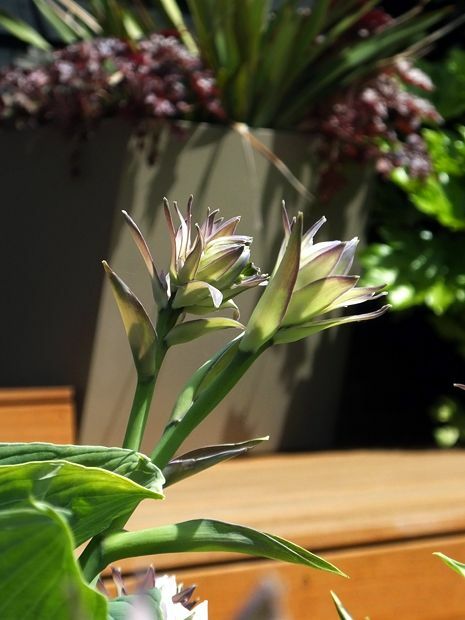 With a busy, dynamic household and three international airports benefiting both abodes, this geographical interchangeability manifests itself in diverse family gardens. Twinned design elements permeate the landscapes of the paired living places, where matching planters, plants and hard landscaping forge an interlinked continuum, albeit contextually site-specific. 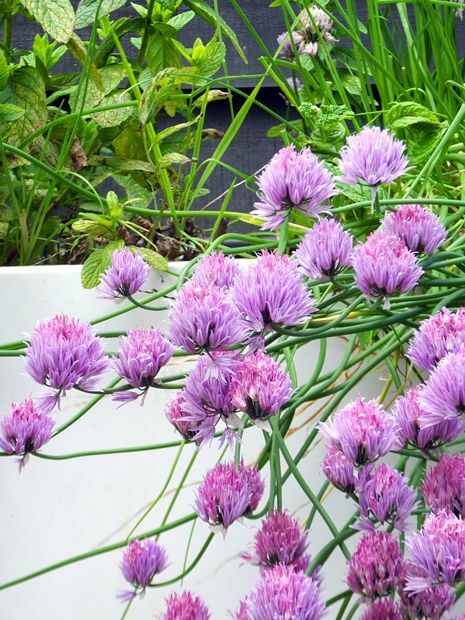 Encapsulated in a mindset of minimal maintenance by choice and necessity, these modern country gardens distil the clients' cultural duality and visual broad-mindedness. 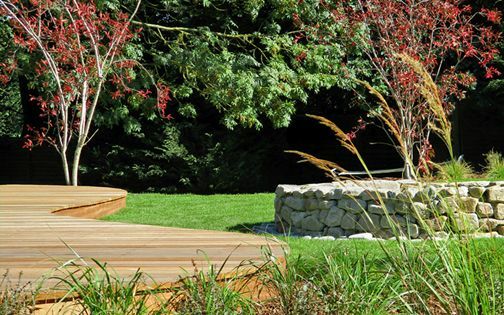 By introducing new floras and habitats, the abundance of wildlife in these reinvigorated landscape gardens has thoroughly diversified; the clients' minimal intervention and inconspicuous maintenance routines enabling undisturbed surroundings. 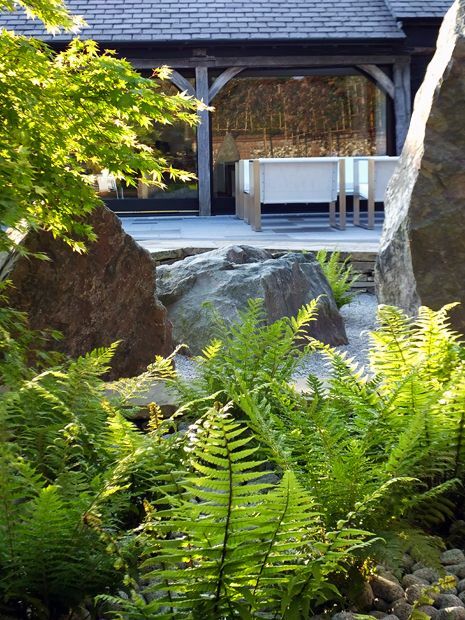 This karmic continuity effuses its sheer bliss in every corner of the grounds, where a sensible rationale conduces balance between a rural environment and the fervent ideals of a contemporary private landscape garden. 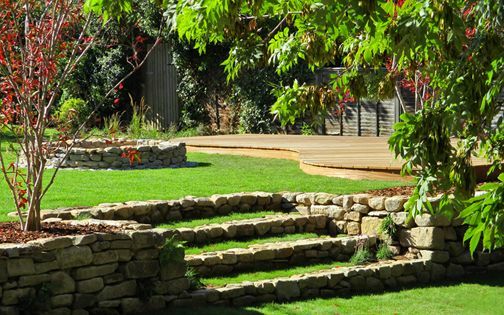 Essentially modernistic and homogeneously integrative, these family gardens outline not only largeness in acreage, but also imbue the owners' intuitive cognisance within the expanded parameters of a modern country garden.